Ok, I am posting a lot today. Sorry to all the readers, but I am quite engaged in these pics and posts. So, here's my next question, if there is abundance of food, when the eagles molt does the marbling pattern change? Thank you! Rajame, the marbling pattern on the youngsters is totally normal. What ISN*T normal is the wide white bands going across the feather, through the shaft, from side to side. Look again at the three fotos that i posted. You see a dark tip = good food, a wide white middle band = poor food, & darker brown areas close to the body = better food, but not good enough. These white bands are on the small body & wing feathers. They wouldn*t be there, had the young Eagle had a good food supply while that part of the feather was emerging. Okay, these are videos i got from near the base of Nest #16-19. My video wasn*t behaving when it came to focusing, & you can hear the lens churning away, trying to focus. i need to fix a setting, i think. i was trying to capture the sounds coming from the Nest & Tree. In this video, both adults have flown to the top of the Nest Tree. The Eaglets are calling to them from the Nest. Do you have food up there? The adults are concerned with visitors getting too close to the Nest. The Sea Lion down the road from them must have them on high alert all day. In this video, you need to crank up your sound, & ignore the churning sounds of the camera. You will hear the happy churbling sounds of two Eaglets being fed! In this next video, we hear the Eaglets again, & then either a parent or a young Eagle*s rusty hinge trill. Thank you, Booni. 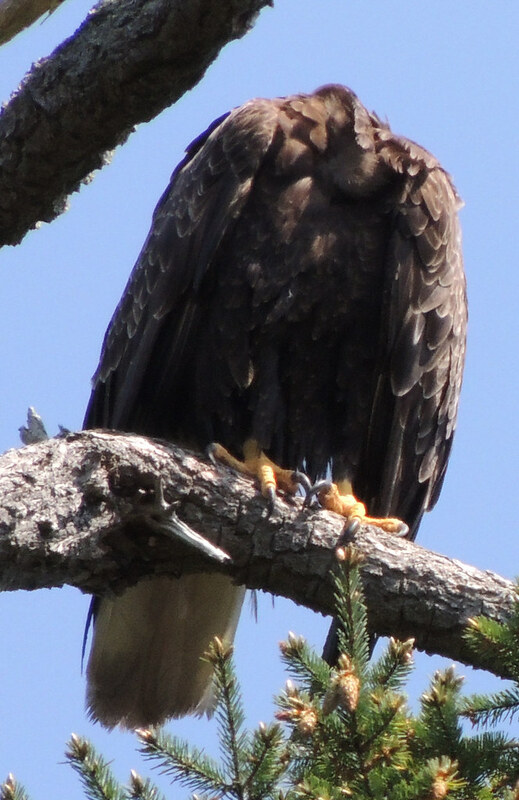 Those poor food situation markings on some eaglets' feathers seem a little like tree rings, in that they provide a visible record. 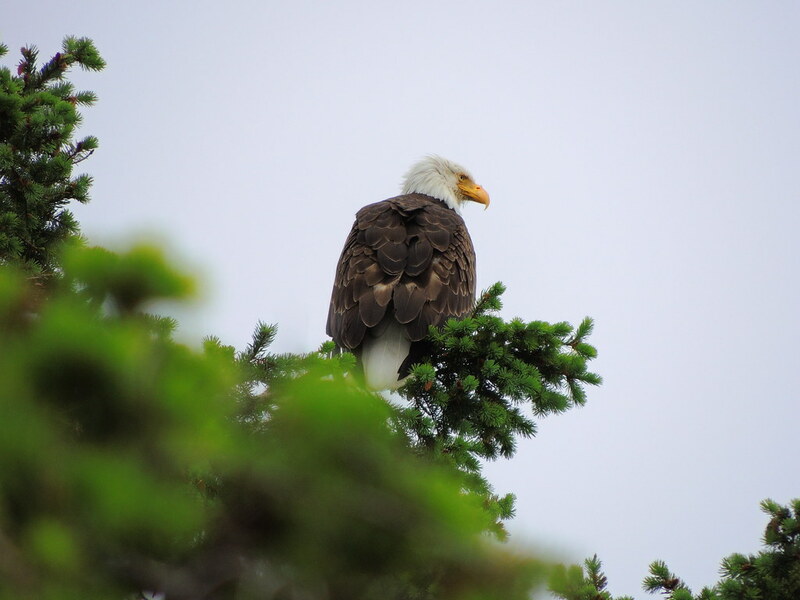 They differ because the tree rings vary with conditions and provide a permanent record, but the eagles' feathers moult eventually. Interesting patterns in nature that we can learn to read as clues. It's nice to see examples, along with your explanations. i believe the opening in the belly feathers is the brood patch. Thank you Booni! I often look deeply at the pattern on the feathers. That helps! This morning i got a call from Reg at MARS! Did i want to catch an Eagle who was down? 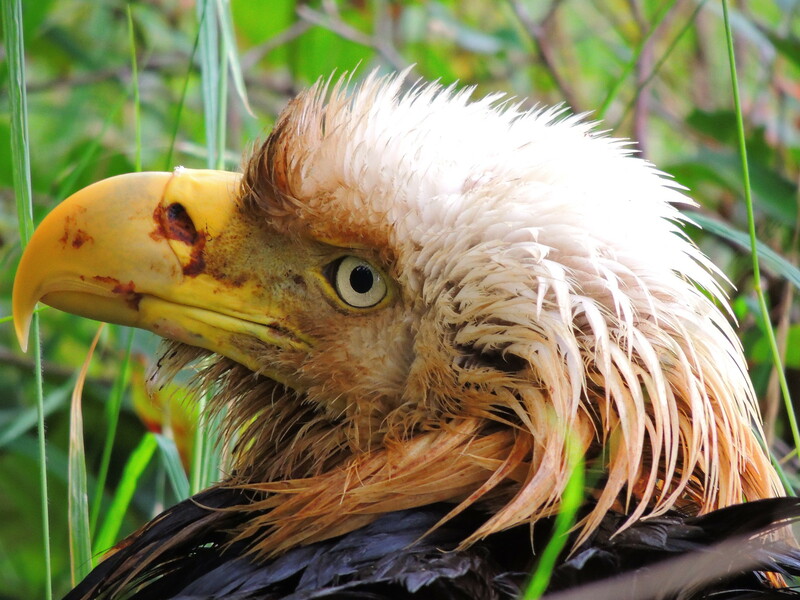 Someone had reported an injured looking Eagle near the Sea Lion. So i called the woman who had reported this. She had seen an adult Eagle, hanging about on & near the ground, trying to fly up to the top of a fence, but then falling back to the ground. The Eagle seemed to be dragging a wing, & not flying very well. Turns out just after i left home, the Eagle had flown down to the beach & disappeared. i went looking for them with my camera. i made my way down the beach towards the Sea Lion, looking everywhere i could think of an Eagle hiding. There is still a lot of Sea Lion left, & lots of young Eagles & Vultures flying around & perched in the trees at the site. i saw quite a few families of Canada Geese with Goslings of all different sizes & ages, all hanging out eating the beach grass together. All the Eagles i saw were flying & perching. i had pointed out an immature Eagle. She said, no, white head & tail, so an adult. 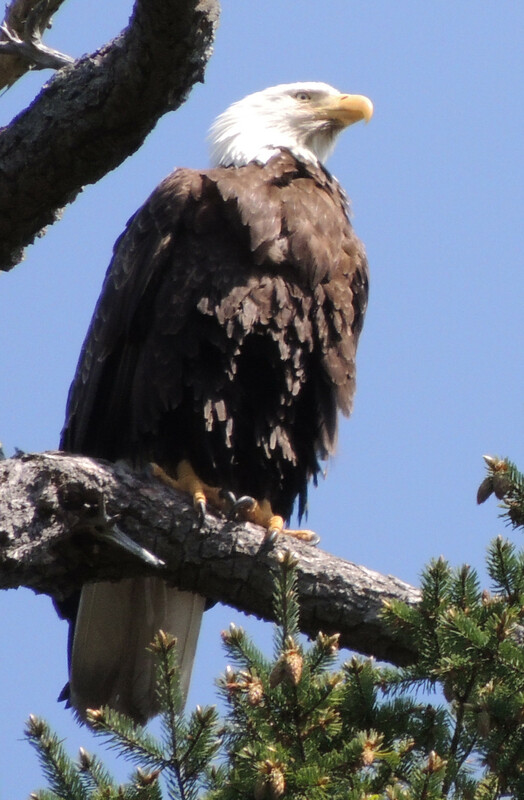 Most of the Eagles i was seeing were youngsters. i made my way back to where i*d started, this time walking all the properties along the beach. 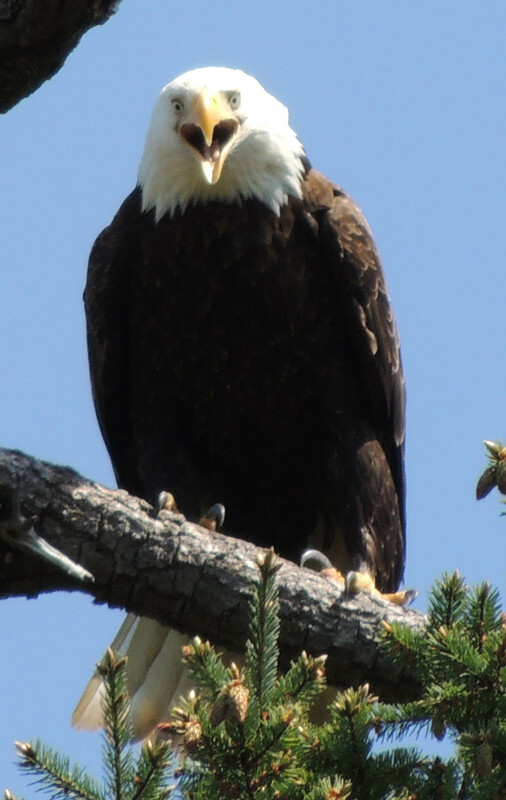 i saw a man & asked him to keep an eye out for me, & call me if he saw any injured Eagles. He said he*d seen lots of fighting since the Sea Lion washed up. i was looking under porches, in piles of logs, on fences, low down in trees, nobody. i got to the house next to the one reported from & searched there. i thought maybe the Eagle turned out to be fine & had flown away. i got into the back yard & saw a pile of Salal brush. A HUGE Eagle, with gorgeous dark feathers that looked oily or wet. i couldn*t believe how huge she was. She seemed to be covered with blood. Or blood from eating the Sea Lion. Her lower head feathers & around her beak were stained with red. & her body feathers too. i took some fotos for observation. Oh dear, Booni. That spot on her back doesn't look normal. Could it be an injury? How long will she be observed before a decision is made on some kind of rescue, if necessary? Poor girl. You can see in the close ups that her head feathers are erect, as are her mantle feathers. She is puffed up from not being well. i think they also puff up in defense, from my being so close. i went back next door & got the kennel & gloves we*d been donated. The people were going to be leaving on the next ferry & would take her to Buckley Bay in their truck to meet MARS! i carried the carrier & gloves right next to where the Eagle was, opened the door, & left it so that the mouth was pointed up & as handy as possible. She was in the Salal, looking over her shoulder at me, & right beside her was a cliff that dropped into the yard next door. i was afraid that when i approached, she*d jump over the cliff. i looked down & away from her & walked towards the cliff. She started to move towards me & away from the cliff! So i got behind her with my big white towel, gloves & eye protectors on. She did a couple of short hops flaps away from me, but she was trapped by the Salal. i said to myself, barb, you gotta just go for it. You*re not gonna tiptoe up to her & catch her this way. So i went for her, using the towel between us. She flopped away again, caught in the Salal, wings outspread. i put the towel side to side over her body & head. i made sure there was enough towel to hang over her head when i picked her up. i used the towel to bring her left wing down from the Salal & folded it to her side. Using the towel over her, i picked her up. i tried to roll her to her side so that i could grab her left leg, but i couldn*t find it. So i just picked her up, using the towel & my hands to hold her wings to her body & hang onto her. Then i made a dash to the carrier & put her in with the towel over top of her. She went in & didn*t move. i was in a rush to close the door, but her tail was sticking out. So i had to pick her up & tuck her in further in order to close the door. i ran next door & they had made room in the back of the truck for the carrier. i called Reg & he said to take out the towel that i had over top of her & just cover the kennel. So i had to open the door & do this. The Eagle wasn*t moving, i thought she had died from fright. i removed the towel & she was quite alive. One of the women met me back at the kennel & we carried it back to the truck next door. They had spread out the tarp i brought, & we wrapped the kennel in it to keep it dark & quiet in there for the Eagle. i tied it all down as best i could, so it wouldn*t flap in the wind while driving & scare the Eagle further. The four wonderful people headed off for the next ferry & were going to meet someone to pick up the Eagle almost near MARS on their way to Campbell River! 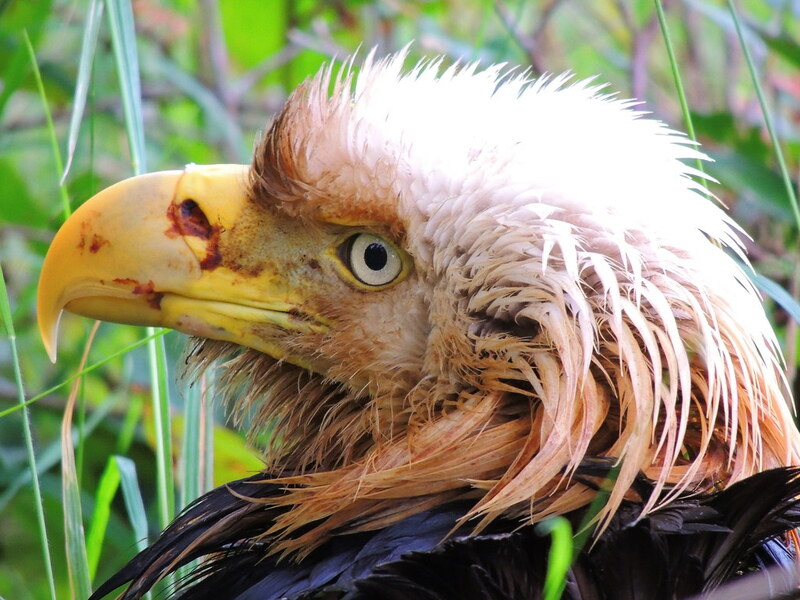 This Eagle was rescued thanks to these wonderful people who called a vet when they saw that something was wrong! All the time i*ve spent photographing Eagles, & yet i was totally surprised by how huge this Eagle was on the ground. 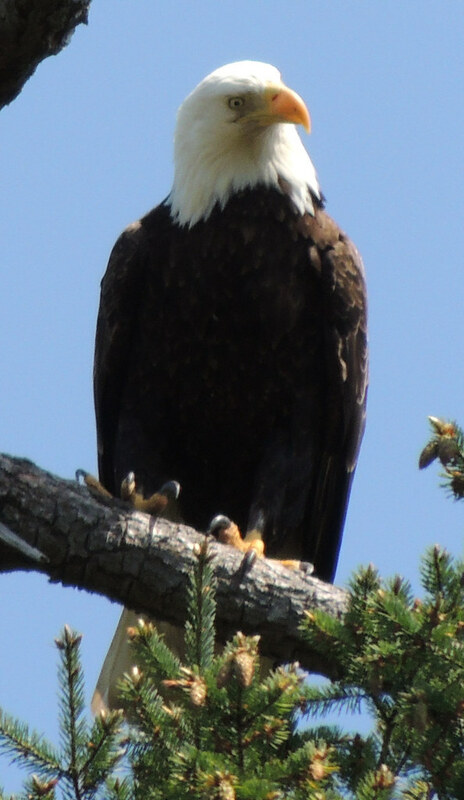 Here is an Eagle that i saw within the territory of Nest #16-19. Is this the tired looking Mum or Dad? 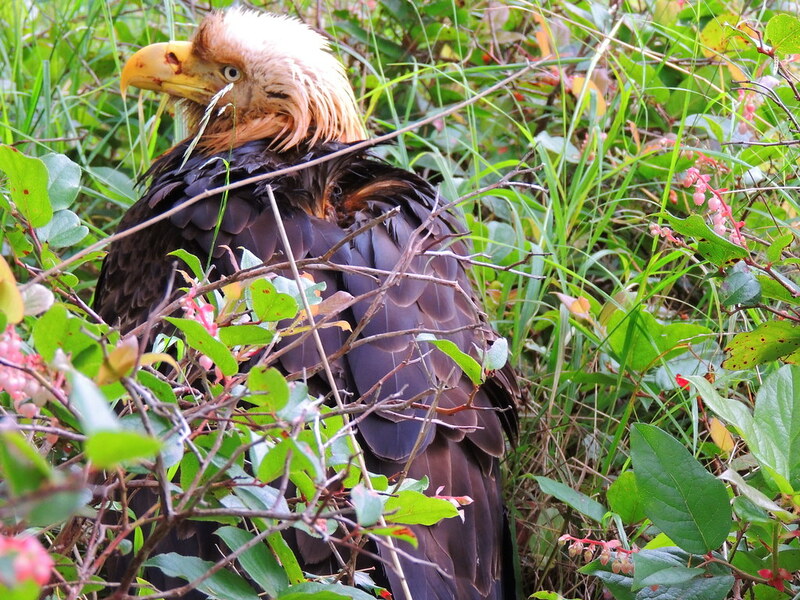 There is worry that the injured Eagle is one of them, & they have two Eaglets to feed! i never checked the Eagle for a brood patch. i just got her in the kennel as quickly as i could & off to MARS to people who know better what to do. Great job Booni! I'll bet your adrenaline was flowing. Fingers crossed here that there's just one eagle in danger. H.E.A.R.T. leaps into action! Great job Booni, thanks. If this eagle is a parent with little ones in the nest, she didn't look like she was going to be able to care for them very well right now. I'm sure Joy will let you know about a brood patch. Hopefully, she is not badly injured and can come home very soon. Barb, that is quite a story! Good for you! I'll bet the adrenaline was pumping through you, head to toe. So many things to think about in a split second. How best to approach her? Will I catch her? If I catch her, will I make her injury worse? Can I get her into the kennel? Oh God, what if I kill her? And then you do it. You just do it! And you did.